As technology gets better, we see all sorts of advancements that makes our lives feel like a sci-fi movie. One of these advancements is the magic of mirror screens. For so long, the space mirrors have taken up has been limited, reflecting only what it sees and serving to make rooms look bigger, offer a hospitable service for your customers or even proving a vital tool for the service you provide for your customers. Because mirrors have traditionally been inactive, the effect of mirror screens can be particularly powerful. Simply put, people just don’t expect to see them. Most agree that traditional mirrors are useful, but there are several ways we can make them more useful. By turning your mirror into a screen, you can enjoy more effective use of your space. Mirror screens can be used for a variety of purposes, from advertising to entertainment- you will not be stuck looking for uses for this amazing technology. Mirror Advertising Screens are a fantastic way to fuse the benefits of an advertising screen with a mirror. Ensuring that your investment is still offering something even when the screen is off, it’s not hard to find its uses. Special ‘Reflections’ technology magically transforms the display into a mirrored screen, so that when it is switched on, the images on the screen appear through the glass with superior clarity. When switched off, the screen reverts to a normal mirror. With a range of frames to suit any interior, a mirrored screen provides you with a surprisingly versatile solution to your signage requirements. Mirror Advertising Screens work perfectly in restaurants, bars & clubs, hair & beauty salons and pretty much anywhere that would normally accommodate a traditional mirror. In these environments, Mirror Advertising Screens are great for displaying adverts, customer information or even entertainment, making sure that your space is being used to maximum effect and your customers are wowed. We also see Mirror TVs work well in residential or hospitality environments, perfect for anyone looking to add that premium feel to their environment, whilst not detracting from an interior theme. 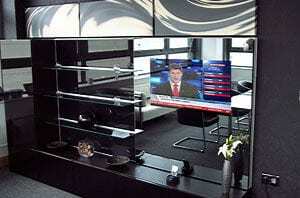 A Mirror TV provides you with an effective solution for combining innovative technology with style. In keeping with our excellent service record, we offer customers the choice of a range of makes and models of TVs in either LCD or LED, with screen sizes of 22” to 75” diagonal. Making Mirror Screen technology even more accessible, Mirror TV overlays come as an easy-to-install retrofit kit that magically transforms any LCD or LED display into a mirror. If you are looking for something permanent or removable, that’s no problem as our overlays are versatile and offer both options. Mirror overlays are a great solution for anyone who already has an advertising screen installed but is looking to give it a premium and practical edge, whilst wowing customers and visitors. For installations requiring custom designs or applications, you can source our special Mirror Glass from us without the screen. Pro Display’s Mirror Glass utilises an innovative optical coating, which, when combined with any LCD or LED screen, displays the screen on the mirror surface. Our Mirror Glass is perfect for anyone wanting to utilise a screen as a part of a mirror, rather than making use of the full mirrored surface. 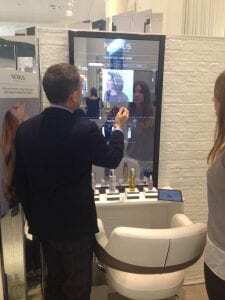 We see this technology work perfectly as part of changing room mirrors, hair & beauty salon stations or even selfie mirrors. 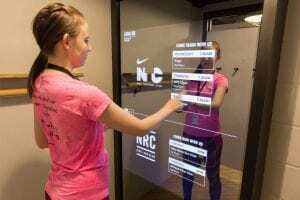 As if Mirror Screen technology wasn’t fascinating enough, you can also grant installations touch capability, creating an Interactive Mirror Screen to engage your customers like never before. Working well with a range of applications, this allows you or your customers to interact with your mirror screen, offering the ultimate in engaging displays. Combining interactivity with your mirror screen sees it make the most of the full package on offer with mirror screen technology. With a keen 6 point touch functionality, innovative display technology as well as versatile styling, you can fulfil your wildest creative ideas whilst increasing the capability of this technology by an immeasurable degree. Turning your mirror into an interactive touch screen gives you far greater control over the delivery of information or entertainment. With touch capability, the user is able to engage directly with the screen, making things such as interactive touch games possible. Not only this, but with the user in the ‘driving seat’, they are able to control the flow of information themselves, helping them efficiently obtain what they are looking for, allowing the next person to use it far quicker than if they were having to wait for a slide or ticker tape information flow. 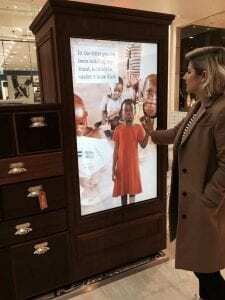 A great example of how creatively interactive mirrors can be used is seen from the world’s largest international children’s charity, World Vision in The Story Shop. They used one of our 55″ Interactive Mirrors to help spread awareness about their The Story Shop campaign. You can learn more about this amazing project here. Selfie Mirrors and Selfie Mirror Booths are fast becoming a popular feature at a variety of events, venues and businesses. This genius application sees Mirror Glass used as part of a booth or installation where users can pose/position and see themselves through the mirrored surface before taking a photograph. Until recently, this has largely been achieved commercially using a basic webcam-screen set up that often does not provide a desirable resolution or user experience. Using Mirror Glass gives you the ability to integrate a screen behind the mirror, not only allowing you to position for your photograph using a real mirror, but also allowing users to display images on top of their reflection, giving them a real-time preview of how their photograph will come out if they have opted to overlay any images. The uses of this range from everything including fun or events-based applications, to clothing stores and fitting rooms. Interior design themes are incredibly important to the hospitality market, and sometimes, if the theme is of a premium feel, it can go a long way in helping to justify the premium price tag of your services. Mirror TVs offer a perfect solution for hotels looking to give their environments some edge. Ideal for use in rooms, or even in the lobby, using Mirror TVs gives you a great opportunity to advertise or inform in a premium way. For use in rooms to entertain, Mirror TVs provide you with an executive touch prefect to communicate to your customers that they are dealing with a quality establishment. This, on top of the practical benefits that Mirror TVs bring, ensures that you are making the most out of the space that you have to help your customers feel that their stay has been worth every penny. We manufacture in Britain and ship worldwide – if you need further information, a pricing quote, or want to discuss ideas for using our Mirror Screens please complete the form below, or call us on +44 (0)1226 740 007.